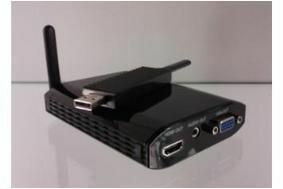 ISE 2011: CYP unveils mini DAC and wireless USB to HDMI converter | What Hi-Fi? That's to say it offers three-way conversion: coaxial inputs can be converted to optical and analogue outputs, optical inputs to coaxial and analogue outputs, and analogue inputs to coaxial and optical outputs. The benefits of this last process should be obvious to anyone who's ever agonised about how to get all their precious vinyl (or cassettes, for that matter) onto a computer hard-drive. The AU-D9 is available for approximately £75 and we should be bringing you a review in the near future. Equally interesting is the CDL-165PRO. This is a wireless USB to HDMI converter, and it does what you might imagine: a wireless USB dongle fits into your computer and sends audio and video information to a receiver with an HDMI output. Plug the receiver into your HD TV and there you go – wireless transmission of all your video files, with an effective range of at least 20 metres. The CDL-165PRO will cost around £250 pounds when it goes on sale some time in March.